BTemplates, the best place for Blogger templates since 2008. 3.6 out of 5 based on 227 bloggers and 40 commenters. How to install a Blogger template. 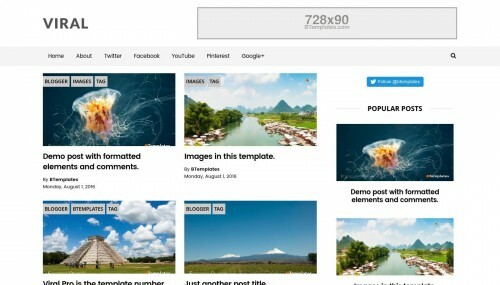 Viral Pro is a free blogger template with 2 columns, responsive design, seo friendly, right sidebar, gallery-styled, minimalist, an exclusive design for Blogger, ads ready, social bookmarking icons, posts thumbnails, pagination, related posts support, 404 error page customized and neutral colors. Excellent template for blogs about any general topic or a personal portfolio site. The demo page is off by blogger. Please, let us know the new demo. WOW!!! It Is Really Great Blog.Thanks For It. lol me too how can 2 previus ? Nice templates! thanks for sharing..
the templates look pretty good. Some different templates.. Simple and beautiful. please! i don’t open preview. nice template, i’ve just downloaded it for my blog. nice template. thanks for it. Muchas gracias, por brindar plantillas de calidad, y muy bonitas, muchas gracias, y sigan asi, van bien. thanks it is supported me much. I just uploaded this on blogger templates. I started putting posts on blogs and when i was trying to edit the post layout section – author profile is not changing nor i get an option to remove from blog profile. I checked from edit layout section but it did not work. Please tell me how can i remove author profile from blog. Excelente plantilla la voy a revisar en uno de mis blog de prueba a ver como se ve, ya que la vista previa no está disponible. Nice Article. Thank you for shearing…….